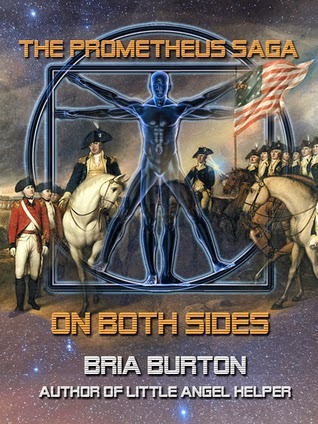 Historical fiction meets science fiction in this delightful story about an alien finding its way through America during the American Revolution as a shape shifting being able to take multiple roles from different sides to gather information on our human existence. We also meet a couple of young brothers who end up at war and find themselves interacting with this alien as different people unknowing it is the same being. It was fun as the reader to be in on the joke as I read along seeing the alien interact with different people. Don't think that this is a spoiler because as you read the story it is made known well before it becomes a surprise to the characters. You are in on the secret the whole time as the reader. This is not a big reveal that has now been spoiled for you. Think of it as something to look forward to as you read this story. You're on the inside and all of the characters are not which was a fun dynamic. I found myself chuckling throughout this story. There is some fun wit written into its prose. Though this story is short it covers a great span of time and throughout there are crafty epistolary sections. Reading the correspondence of letters between a woman of the era and the alien who keeps becoming someone else was fun. Their personalities are so different and you only get to read the letters written by the woman so filling in the blanks of what the alien's letter must have said was like a little puzzle that made me smile. The story is not anything like the science fiction I usually read which is why I'm glad I read it. It kind of reminded me of Downton Abbey and The Patriot but with a splash of science fiction to change the flavor. The flavor is changed only in a subtle way and the reliance of the reader knowing the shapeshifter is an alien sent to gather intelligence on the human race made me read with a sharper eye. If you pay attention there are a lot of fun subtle clues that lead you to know just who the alien is though its appearance would cause you to think otherwise. Seeing how the other characters react upon meeting this creature was a lot of the fun of this story. Thanks so much for reviewing the story. It sounds like you enjoyed it, and that's always a thrill for a writer, as I'm sure you know. I do know and it was a fun read! Glad I read it.